33 Today we played with the hover pucks some more, this time with the help of some skinny rubber bands tied together. We discovered that if two rubber bands were pulling equally in opposite directions and one let go, the puck would go towards the one that didn’t let go. We also discovered that if you try to use the rubber bands to LIFT the puck, they stretch really really far…much farther than they stretched when we were pulling the rubber bands horizontally or at an angle. Additionally, if you pull a hover puck with one rubber band and expect it to go at constant velocity, the rubber band will go slack as you try to maintain constant velocity. By the way, in this photo the puck is not turned on, so it is at rest on the floor. 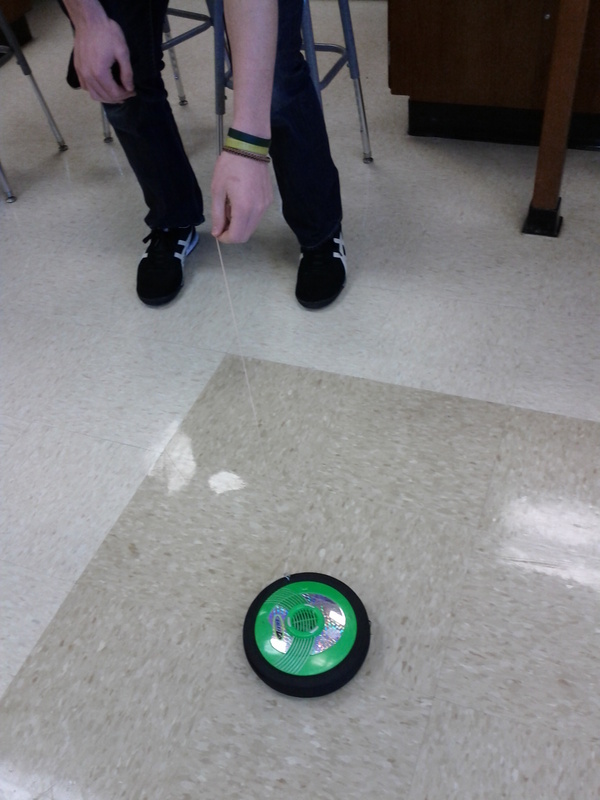 A student is pulling with a rubber band but not enough to make the puck start moving.